So here’s the thing, the other night I had a very, very odd dream, and as I’m not one to dream all that much, thought you might find it amusing. Setting the scene then: My hubby looked like Trevor Eve – he of Waking the Dead fame – we lived in a flat with a view to die for, but was full to the beams with untidiness. 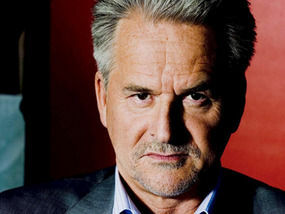 (I’m happy with Trevor Eve, not so with the untidiness). I had one of my daughters living with me, but she looked like my other daughter, and I bought a new car. Bonkers so far? Yep, I thought so too. Trevor – err Hubby – went out for his normal squash night, and rather uncharacteristically he was carrying a holdall plus a suit bag. He was also snazzily dressed, although the heavy gold chain was worrying. He smelt divine, having bathed in his best smellies. And while I’m picturing all this, I mustn’t forget the massive grin. I asked him why so smart. His smile reached ear to ear as he reminded me that drinks afterwards required a sweat-less appearance. He squeezed my arm, left, met another woman downstairs, who incidentally had a million and one children, and never came home. Meanwhile, upstairs in yonder untidiness land, I’m watching him canoodle with his new woman. And as one does when ones husband abandons her, decided I need a new car. Off I charge to pick up a vehicle I have purchased but never seen. The car being the old style Scenic with both exterior and interior made of teddy bear fur – yes I did say exterior. Daughter and I got in. I pulled the visor down, only for it come away in my hands and merrily lobbed onto the back seat. I’m not sure if the image of fur car or hubby leaving me brought me out of my slumber, but at this point my eyes opened and I peered at my hubby who none the wiser was grinning in his sleep. What the heck was that all about? I’m baffled. Hubby had a good laugh mind, assuring me he wasn’t about to give me the old heave-ho, and I have decided to check him out very carefully next week when he leaves for squash! We also decided that if there was a message in all this madness, then it could only be that people and things are not what they seem! I watched a ‘Waking the Dead’ today. Trevor Eves is a bit too moody for my liking, but maybe in small doses. 😕 A fur car could be very comforting indeed. Crazy dream. The teddy bear fur car amused me, though. I actually googled fur cars and you’re not going to believe this, but there are cars like that out there. They are mighty odd! Good of you to remember your dream!